He was born in Ribes de Freser (Girona, Spain) on the 17th of February, 1953. He studied at the University School of Girona, the Autonomous University of Barcelona and the University of Paris. In 1976 has a University degree in Philosophy and Arts in Autonomus University of Barcelona, in 1986 he earned a Doctorate degree in Quaternary Geology from the University of Pierre and Marie Curie (Paris) and in 1988 he earned a Doctorate in Geography and History from the University of Barcelona. In 1983-84, thanks to a scholarship granted to him by the Spanish Council for Scientific Research (CSIC), he carried out research at the Complutense University and the National Museum of Natural Sciences in Madrid and also collaborated with the Institute of Human Palaeontology in Paris. 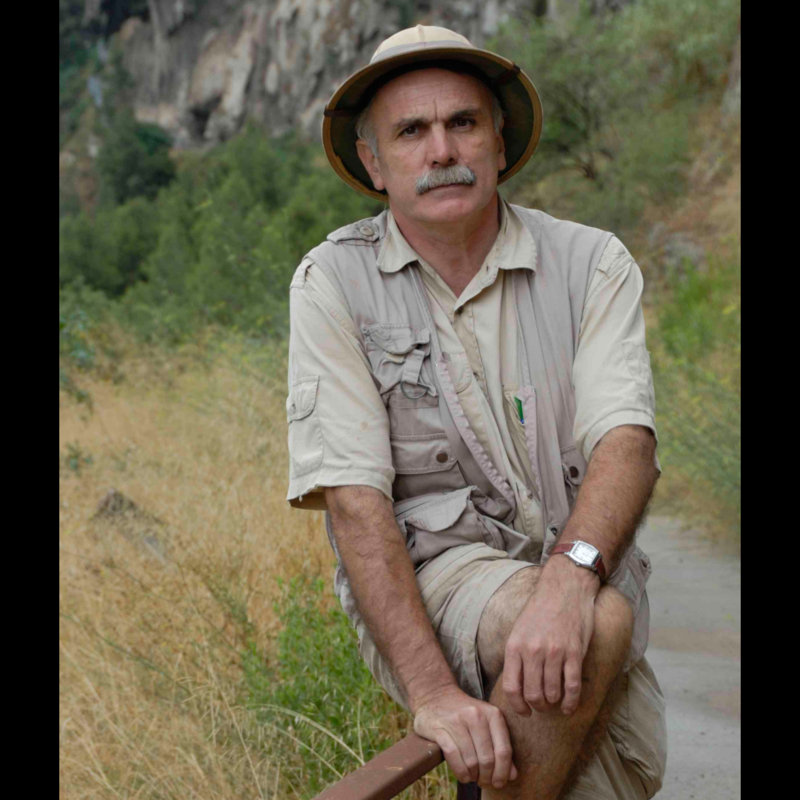 In 1988 he began working at the University of Tarragona, since 1999 he is a Head Researcher for the Quaternary Human Autoecology Group at this same university and Director of the Catalan Institute of Human Paleoecology and Social Evolution (IPHES), created in 2005. Also, Eudald Carbonell has been one of the co-directors of Fundación Atapuerca (Burgos) alongside Dr. Juan Luis Arsuaga (Complutense University of Madrid) and José María Bermúdez de Castro (National Research Centre on Human Evolution). He has participated in research and field work in France, Italy, Slovenia, Croatia, Georgia, Tajikistan, Algeria, Morocco, Tanzania, Kenya, Ethiopia, the United States, Mexico, Chile, Cuba, Eritrea, China and Australia among others. At a young age he started to perform research on the first settlers of the valleys along the Ter and Freser rivers in Girona. In the early 1970´s, he excavated sites at Roc de les Orenetes, Rialp and Tut de Fustanyà in the Ribes Valley while surveying the regions of Ripollès and Osona. In Girona, he was a member of the Archaeological Association of Girona and together with D. Josep Canal i Roquet, they decisively contributed to the acknowledgement of the Lower Palaeolithic in the Northwest of the Iberian Peninsula which up until that point had been systematically rejected by the academic world. His most outstanding scientific milestones are the creation of a system for analysing prehistoric technology called "logical-analytical system" and his studies on the ancient settlements of the Iberian Peninsula. These lines of work led him to develop a multidisciplinary research program in the Sierra de Atapuerca (Burgos), which was initially headed by Professor Emiliano Aguirre. Work in Atapuerca has enormously enriched scientific knowledge in the fields of prehistory and paleoanthropology especially with respect to the evolution of stone technology that is being uncovered in Atapuerca. An extraordinary population was exhumed from the archaeological sites of Sima de los Huesos (500,000 years), the remains of Gran Dolina (800,000 years) and the Sima del Elefante (1,200,000 years) where a new hominid species was discovered, the Homo predecessor. One of the core themes of the research is to try to understand the reason behind these migrations and explain them in terms of technological and social behaviour instead of in climate or biological terms by using traditional explanations. Carbonell suggests that technical selection is a mechanism for the evolution of human behaviour, and he applies this to his work at Abric Romaní (Capellades, Barcelona), a Neanderthal site where the gap between the behaviour of Neanderthals and the first anatomically modern humans is shown not to be as wide as what had previously been speculated some years ago. According to Carbonell, the property of using tools to make other tools is what distinguishes the Homo genus from other living beings. Technical selection has been imposing itself as an evolution mechanism for human behaviour over 2,500,000 years. Therefore, complexity is a common biological property in the animal kingdom, but technical complexity is a property of human beings which began to be acquired long before the appearance of our subspecies. Homo sapiens have integrated and synthesised the set of technical, symbolic and cultural acquisitions arising out of the hominization process. However, for Carbonell, “hominization” and “humanization” are not synonymous. Humanization has not yet been reached and can only be reached with critical social thought. That's why it's necessary to make progress in the socialisation of knowledge so that by following innovative mechanisms, adequate for the new age, technological benefits can be patrimony for the entire population. Scientific and social pedagogy on what integrating diversity means on all levels is necessary to achieve these goals and reach a critical consciousness of the species. From Carbonell's scientific field of work, this occurs by spreading evolutionist ideas with critical social thought and praxis. Ideas that will only be incorporated into people's education when we're able to account for them with our own knowledge, interests or beliefs in all fields of human dimension. Thus, the researcher is a fervent advocate of culture as a critical mechanism for intellectual education so that human society is freer, just and more egalitarian.